LONDON (Reuters) — Iran‘s elite Revolutionary Guards have deployed forces to three provinces to put down an eruption of anti-government unrest after six days of protests that have rattled the clerical leadership and left 21 people dead. The protests, which began last week out of frustration over economic hardships suffered by the youth and working class, have evolved into a rising against the powers and privileges of a remote elite, especially Supreme Leader Ayatollah Ali Khamenei. Defying threats from the judiciary of execution if convicted of rioting, protests resumed after nightfall with hundreds hitting the streets of Malayer in Hamadan province chanting: "People are begging, the supreme leader is acting like God!" Videos carried by social media showed protesters in the northern town of Nowshahr shouting "death to the dictator"—an apparent reference to Khamenei. In a sign of official concern about the resilience of the protests, the Revolutionary Guards commander, Major General Mohammad Ali Jafari, said he had dispatched forces to Hamadan, Isfahan, and Lorestan provinces to tackle "the new sedition." The Revolutionary Guards, the sword and shield of Iran‘s Shi'ite theocracy, were instrumental in suppressing an uprising over alleged election fraud in 2009 in which dozens of mainly middle-class protesters were killed. Khamenei condemned that unrest as "sedition." Anti-government rallies, held in defiance of the pervasive security services, have called for the downfall of the Islamic Republic, posing one of the most sustained challenges to the established order of the major oil-exporting state since the 1979 Islamic Revolution that overthrew the U.S.-backed Shah. In a state-sponsored show of force aimed at countering the outpouring of dissent, thousands ofIranians also took part in pro-government rallies in several cities on Wednesday morning. State television broadcast live footage of rallies in cities across the country, where marchers waved Iranian flags and portraits of Khamenei, Iran‘s paramount leader since 1989. Pro-government marchers chanted, "The blood in our veins is a gift to our leader (Khamenei)," and, "We will not leave our leader alone." They accused the United States, Israel, and Britain of inciting protests, shouting, "The seditionist rioters should be executed!" In the Shi'ite holy city of Qom, pro-government demonstrators chanted "death to American mercenaries." On Tuesday, the 78-year-old Khamenei had accused Iran‘s adversaries of fomenting the protests. U.S. President Donald Trump, who has sought to isolate the Tehran leadership, reversing the conciliatory approach of predecessor Barack Obama, said Washington would throw its support behind the protesters at a suitable time. "Such respect for the people of Iran as they try to take back their corrupt government. You will see great support from the United States at the appropriate time!" Trump wrote in the latest of a series of tweets on Iran‘s turmoil. More than 100 Iranian woman activists voiced support for a new uprising in a statement on Wednesday. 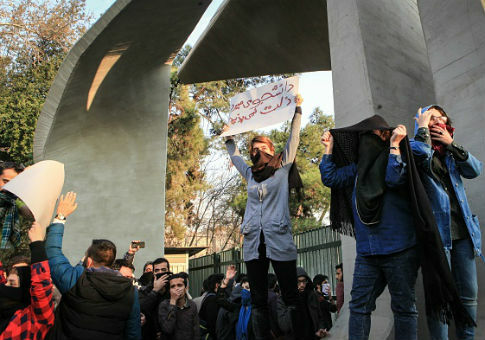 Several prominent Iranian lawyers, including Nobel Peace Prize laureate Shirin Ebadi, urged Tehran to respect people's right to freedom of assembly and expression, guaranteed under the constitution. Zeid Ra'ad al-Hussein, U.N. High Commissioner for Human Rights, said hundreds of Iranians had been arrested in the past week, and called for "thorough, independent, and impartial investigations of all acts of violence." Hamidreza Abolhassani, a regional judicial official, said a European citizen had been arrested for leading rioters in the Borujerd area of western Iran and was suspected of having been "trained by European intelligence services." The detainee's nationality was not given. The outburst of dissent is the most serious since Iranians took to the streets in 2009 over accusations of vote-rigging in the re-election of then-President Mahmoud Ahmadinejad, a conservative hardliner, over two reformist challengers. The protests have heaped pressure on President Hassan Rouhani, a relative moderate who championed a deal struck with world powers in 2015 to curb Iran‘s disputed nuclear program in return for the lifting of most international sanctions. Many of the protesters are fuming over what they see as the failure so far of Rouhani's government to deliver on promises of more jobs and investment as a dividend of the nuclear accord. Trump must decide by mid-January whether to continue waiving U.S. sanctions on Iran‘s oil exports under terms of the nuclear deal he opposed. But if he reimposes sanctions, he risks worsening the economic pain of Iranians he has vowed to help. This entry was posted in National Security and tagged Ali Khamenei, Hassan Rouhani, Iran, President Trump, Protests. Bookmark the permalink.